The Servian Wall (the black wall in the map below), also known as the Republican Wall, was a defensive wall constructed in the early 4th century BC, and named after the 6th king or Rome, Servius Tullius, who ruled from about 550 BC until about 510 BC. 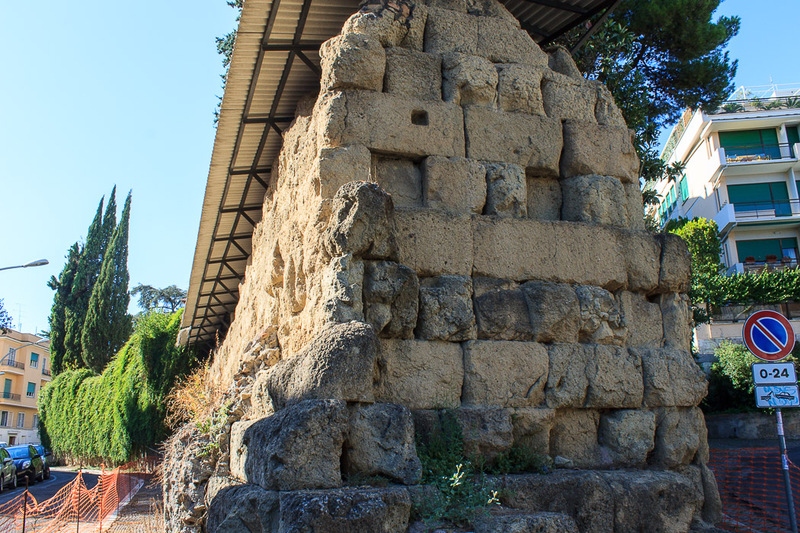 It superseded defensive walls that might have been dismantled in response to Etruscan demands, and was itself superceeded by the taller, stronger and much larger Aurelian Wall, built between 271 AD and 275 AD. The Servian Wall was 32 feet tall in places, 12 feet thick at its base, and 7 miles long. It was built from large blocks of tufa. To my eyes, it looks like a rough wall made of square blocks piled on top of each other, with the joints being very well done. Here we are, 2500 years after its construction, and there are not really any gaps between the stones. 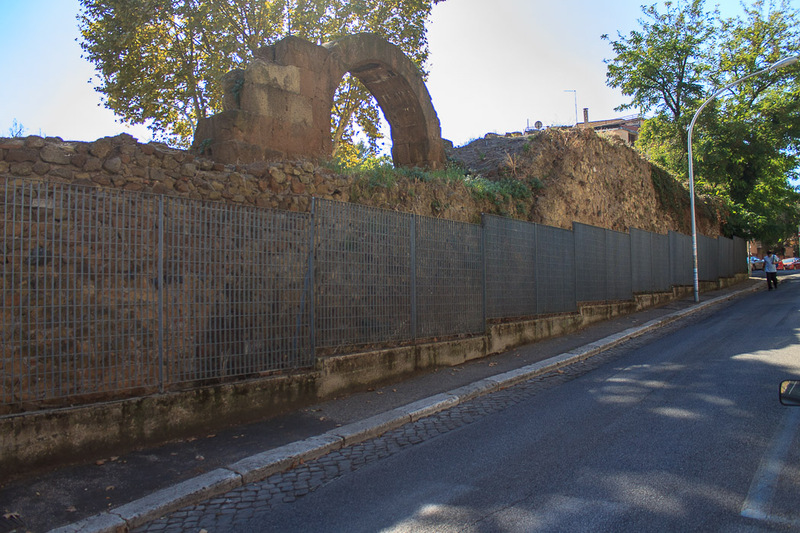 It is believed to have had 16 gates, but only three still exist (Porta Esquilina = Arch of Gallienus, Arcus Caelimontani, Porta Sanqualis). 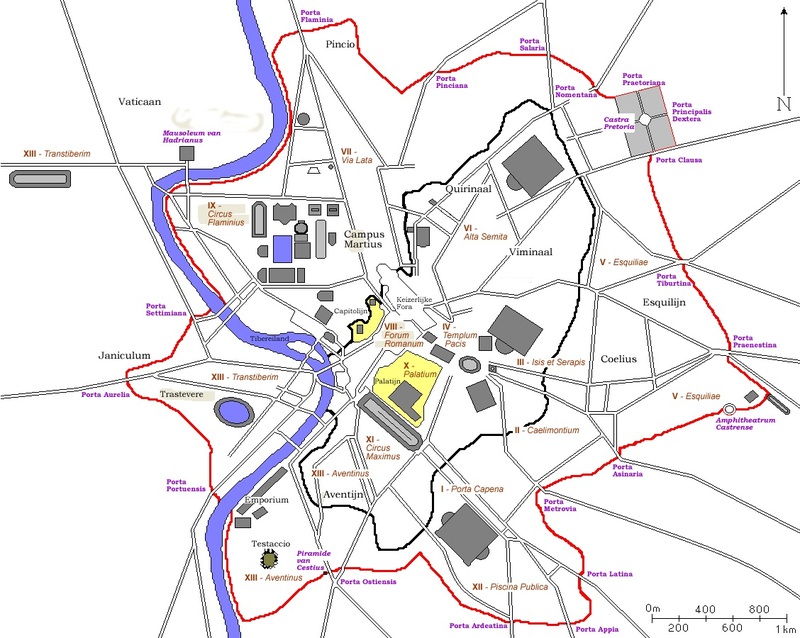 The Servian Wall was maintained throughout the age of the Roman Republic and the early Empire, but by this time, Rome became well-protected by its military strength and the city was essentially not walled for the first three centuries of the Roman Empire. However, when German tribes attacked the frontier in the 3rd century, Aurelian had the larger Aurelian Wall built to protect Rome. In the end, even that was not enough. 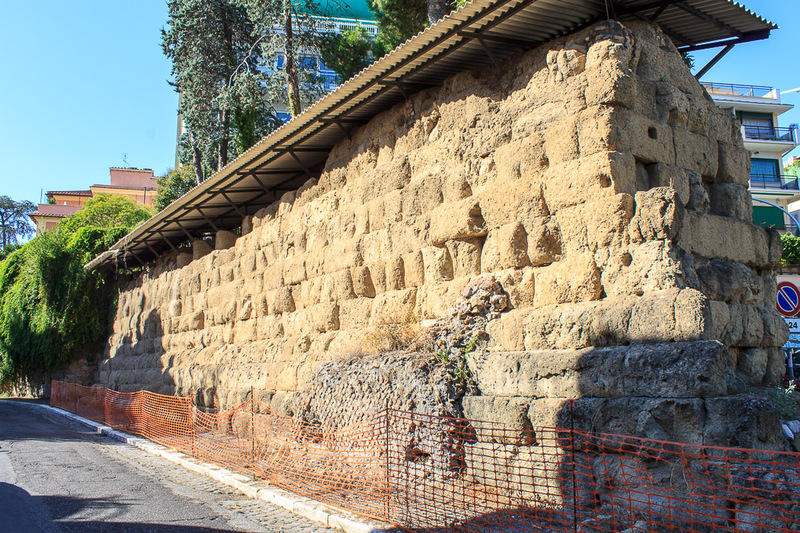 Two very cool pieces of the wall are at the western end of Piazza Albania and the nearby Via di Sant'Anselmo, about 1/3 of the way from the Circo Massimo metro station to the Piramide metro station. The part in the piazza is shown in the 1st photo below, and features an arch for a defensive catapult from the late Republic. Just a short walk uphill along Via di Sant'Anselmo shows an awesome stretch of the wall where you can easily see both sides of the wall, and also a cross-section of the wall in order to learn a bit about its construction (2nd and 3rd photos below). See all Servian Wall and Gates photos.